FFWPU Latvia: The 10th Festival of Global Culture was held in Riga, Latvia, at the Peace Embassy, on December 20, 2014. Activists of the Universal Peace Federation, Japanese missionaries and seven new guests attended the event. One guest decided to take part in the 7-days seminar which will take place in Antalya, Turkey. He came to the headquarters of the UPF in Riga, to learn about the Divine Principle, and as a result decided to go to the seminar in Antalya. Interesting programs inspire and draw us closer. 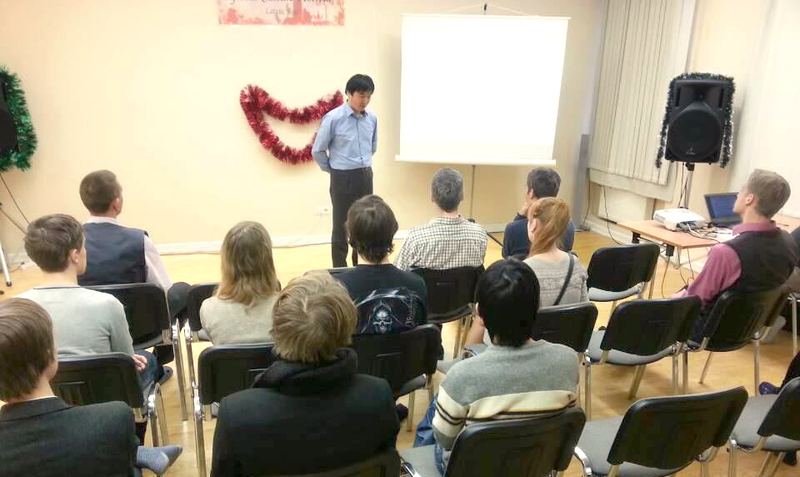 Dr. Ando, the national leader in Latvia, gave a short lecture about the Give-and-take Action. Participants were deeply inspired by the Divine Principle. It was a good opportunity to witness to the Latvian youth and students, which made possible for some students to joined us.